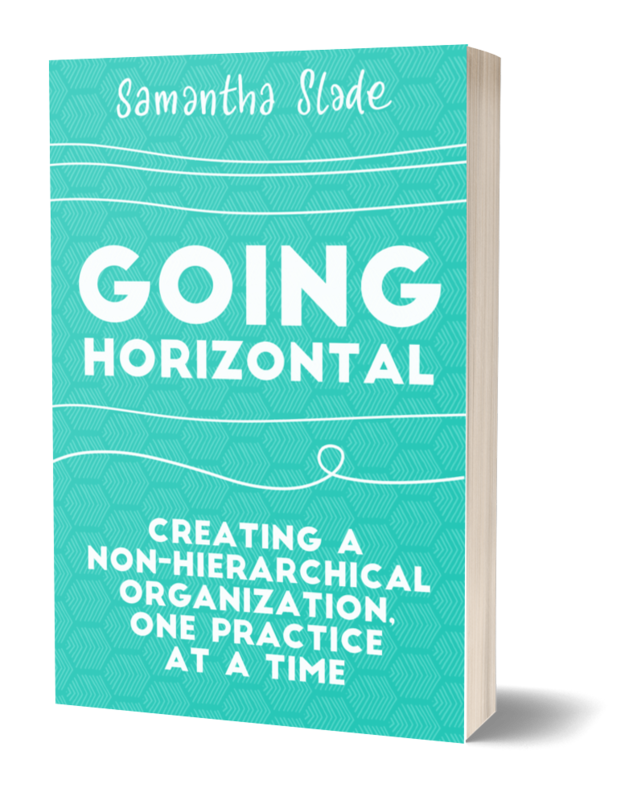 In Going Horizontal: Creating a Non-hierarchical Organization, One Practice at a Time Samantha Slade has captured in plain language how to achieve what so many of us have longed for deep down: A genuine invitation to common purpose through non-hierarchical practice, simple rules, and self-reflection. While the book’s tone feels like a conversation around Slade’s Montreal kitchen table, her guidance around “domains of practice common across all organizations” emerge from years of skilled, systematic inquiry and testing. She offers ways to remake organizations into systems of action and relationship built on trust, respect, and purpose rather than fear-based relationships that emerge when one looks down upon another. Slade builds on a foundation of non-hierarchical practice and organizational development experience through her firm, percolab, whose affiliates and offices in Montreal, Brussels, and Barcelona function using non-hierarchical methods. Reinforced with simple but powerful diagrams by percolab designer Paul Messer, the book showcases Slade’s training as an educator along with lessons from years of fusing successful collaborations across international boundaries. A step-wise path of tested practices reinforce her argument that organizational hierarchy is obsolete. That humans are “hard-wired for autonomy” is a fundamentally Western assumption. Slade suggests that autonomy is meaningless without being part of a larger whole, where for better or worse, we all play critical roles. Some might argue that a misinterpretation of autonomy is one of the reasons we have such trouble with hierarchy. Because of careful, deliberate processes that truly respect the insights and roles of each participant, Slade’s insights emerge as horizontal stones leading toward a sense of possibility that allow people to feel connected again. And true connection is much more likely when sitting side by side.